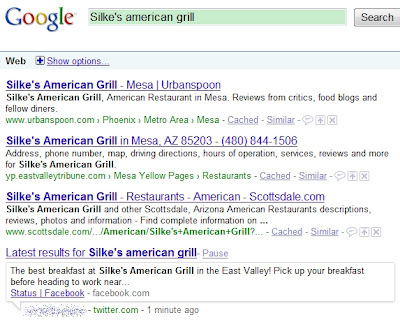 How to drive real-time traffic to local business with Google Search? First of all, Google rocks! With the new blend-in search result from Twitter, Google is showing real-time result and potentially drive traffic to web site that offers great stuff such as local coupons, discount price or virtually anything. SmartLocalShoppers.com is built to utilize the latest technology to help local businesses getting exposures. Here is the prove. There is no surprise that the result won’t show up again few minutes later. The chance to see the same tweet on Google search result is slim, but there is still chance to drive real-time traffic to a web page when the moment is right! Obviously, Google is playing with many new features that no other search engines are doing. We post a new status update on Facebook fan page and it was picked up by Twitter! It’s just that simple! We all know that Google is always changing the algorithm. So there is no need to manipulate anything. SmartLocalShoppers.com is dedicated to help local businesses getting extra exposures over the Internet without paying fortune. SmartLocalShoppers.com simplify the process to create organic search engine traffic and GEO Targeting integrated with Google Map! With advance local search marketing behind the scene, local business can publish local promotion and local coupons at minimum cost. Visit out Coupon Advertising page for more detail.